RustyYoungMan, Danwin22, Divebum and 13 others like this. Good for her! This link takes you to her page and the article is front and center. RustyYoungMan, CaptainMorgan, switchbow and 1 others like this. Outstanding! Congrats to the champ! Way to go Jessie Duff. Congratulations on your championship title. Awesome! Congratulations to Jesse Duff! There is no doubt this woman is amazing! Very good front person for Taurus! Yeah Jessie! 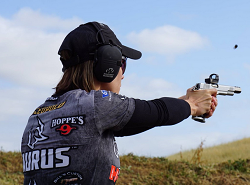 And folks - she'll be at the Rapid City TaurusArmed.net meet September 8,9,10 - so come on out to meet her and get an opportunity to shoot with her - and maybe even have her give you some tips for improving your shooting skills! Met her in PA at the outdoor show and afterword when we met with Taurus, real nice person. RustyYoungMan and Sekol like this. That chick can shoot. Wish I was that good. If I could be half as good it would be a big improvement. Sekol and taurustoter like this. I carry to defend my loved ones; Desensitizing and educating are secondary & tertiary reasons. Anything else is unintended. Federal Champion - QC issues?